Representatives from the Warwick Valley Central School District receive Green Ribbon awards. Shown from left: Frank Brogan, U.S. Dept. of Education; Sharon Davis, WVCSD BOE President; Cindy Leandro, WVCSD Assistant Superintendent for Human Resources; James Yap, WVCSD Assistant Superintendent for Curriculum & Instruction; Sandra Wood, Park Avenue Elementary Principal; Dr. Larry Washington, Warwick Valley High School Principal; Lynn Lillian, WVCSD BOE Member; Dr. David Leach, WVCSD Superintendent; Adam Honeysett, U.S. Dept. of Education. 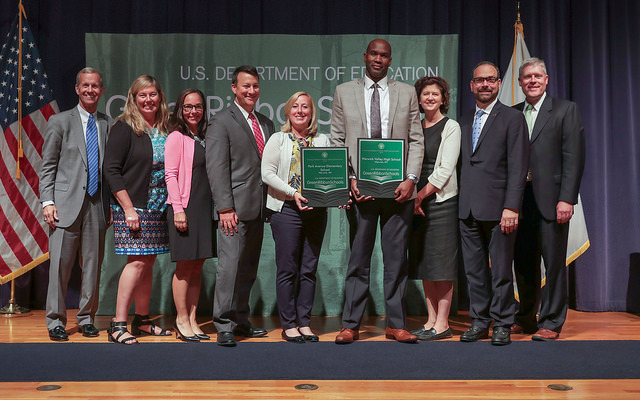 Park Avenue Elementary School and Warwick Valley High School were among forty-six schools and six districts recently honored at the 2018 U.S. Department of Education Green Ribbon Schools ceremony for their innovative efforts to reduce environmental impact and costs, promote better health, and ensure effective environmental education.